The Monsanto Fund helped the Southern Illinois University Edwardsville School of Engineering successfully conduct its annual Summer Camps during June. The $15,000 grant assisted the School in hosting two separate weeklong camps for 55 high school students from six states by providing scholarships, supplies and instruction costs. 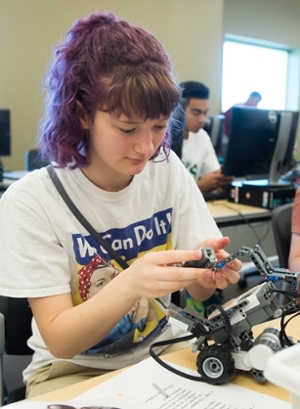 “We are grateful for Monsanto Fund’s support, because these camps open a world of engineering possibilities to students and let them know that SIUE is a great place to learn and discover,” said Chris Gordon, associate dean of the SIUE School of Engineering and summer camp director. “During the past five years, campers from 12 states have participated in the summer camps. The Phillips 66 Wood River Refinery is also a corporate sponsor for the camps. Photo: Emmy Pruitt of Godfrey works to complete her robotic device.